We serve a great God. It’s so reassuring to know that He is the One Who gives life, and Who takes it away. We will not “die before our time” nor live one second longer than He has ordained. “We are immortal till our work is done.” He is the One Whose voice will raise the dead at the final resurrection. So what does it mean that Jesus is the Resurrection and the Life? We’re going to look at a few occasions in Scripture where Jesus demonstrated His power over the grave, death and hell. The first is a case of a death bed conversion. I’ve personally heard of three cases of death bed conversions. While that’s not many, if it’s your relative, that’s the one that matters. We had a chance to share the gospel with my brother-in-law on the day he died. Only God knows the results. The only instance of a death bed conversion in Scripture is the thief on the cross. While not literally on a bed, it was still done a few hours before his death and with a knowledge that he’d soon be facing the Judge of the earth in his guilty state. What does this teach us? One: No one is beyond hope. Even a condemned criminal with no redeeming qualities inherits eternal life simply by believing in Christ. Two: We are not saved by baptism or works. They follow salvation, but do not merit it. This man had no opportunity to get down from his cross and do good works or be baptized. Again, he was saved by faith in Christ. Three: There is no such place as purgatory. If anyone would have needed to go there, it would have been he. Jesus didn’t say, “After you’ve suffered and paid for your sins a while, you can join me in Heaven.” He said, “Today, you’ll be with me in Paradise.” It was an immediate reward for his faith. Four: There is no soul sleep until the resurrection, but we are “absent from the body, present with the Lord.” It happens ‘today’, when we die. Five: Heaven means to be in the presence of God. He would be with Jesus. The overall lesson from this is that faith alone in Christ alone is the only means of securing a place in Heaven, safe with Jesus and protected from the wrath of God. Why is there only one example of a death bed conversion in Scripture? There is only one, so we do not presume to have time, and yet there is one, so that we do not despair. Next we’ll look at five other passages that show it doesn’t matter what stage of death a person is in. Because Christ has resurrection life within Himself, He is able to reverse the effects of sin, the worst being death. Christ’s miracles showed either His control of creation as its Creator by calming the storm, turning water into wine, providing bread in the wilderness, walking on water. He also revealed His power as God to reverse the effects of the fall by casting out demons, curing illnesses like leprosy, chronic bleeding or fevers. Or healing the hopeless, like paralytics, deaf, blind and mute. However, the greatest miracle He performed was the raising of the dead. To reverse death is something only God could do. In this passage, Jairus’ daughter had just died. He raised her back to life after just a few hours. In this instance, the person, the widow’s only son, is in the funeral procession, on his way to being buried. In this instance, his friend Lazarus has been dead for four days and has decomposed and already ‘stinks’. It’s been said that when Jesus called Lazarus out of the grave, if He hadn’t called him by name, the whole graveyard would have emptied out! Most significantly, His own resurrection, accomplished by His own power, was unique, in that He was raised with a glorified body, and He did not die again, unlike our other examples. Finally, at the Judgment seat of Christ, everyone who has every died will be raised. It doesn’t matter how they died or where they were buried; in the earth or the sea, they will stand again on the earth. So we don’t need to fear. No matter how many millennia we may have been dead, He is able to re-animate us and give us resurrection bodies like His own, bodies that will never die. We first hear His voice and wake from spiritual death. At the Resurrection, His voice will wake us from physical death. As God, His voice wakes the dead. All judgment has been committed to the Son. It is the voice of Jesus Who will wake us from death. So we see, Christ is in control of our lives. He can save someone on their death bed. There is no one too far gone for Jesus to reach. His power to raise the dead is shown in His ability to raise one who just died, one on their way to burial, one in his grave four days, or those dead for thousands of years. Most importantly, He was raised from the dead as proof that God the Father accepted His sacrifice. He was raised in a glorified body, never to die again. He was the first of a new humanity under Christ, instead of Adam. Questions- Do you know of any death bed conversions? Which of Jesus’ miracles mean the most to you? Do you feel you are realistic about the concept of death, or do you avoid the topic? Do you feel the same when you consider your own death? 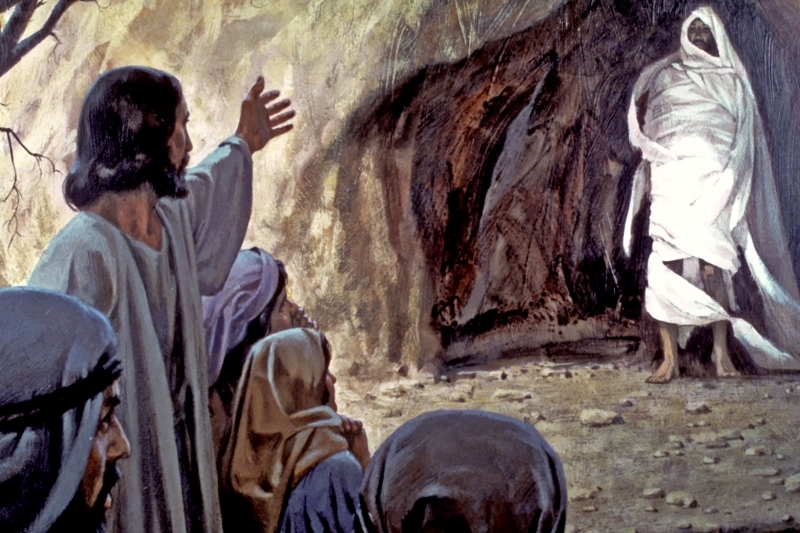 Does the resurrection of your body give you hope? Sovereign ruler of the skies! Ordered by thy wise commands. All appointed were by him. As shall please our heavenly Friend. Till the God of love sees fit. Order’d by his wise decree. Pia is a follower of Christ, a wife, a mom, a former Oncology Nurse, writer, Bible teacher and retreat speaker. Author of the upcoming novel, Benaiah, Mighty Man of God. Teaching others of the greatness of the God of our Salvation through stories and Bible lessons. Making the deep truths of Redemption easy to understand.